April’s about to get a whole lot louder with the news that Aerosmith are returning to Australia for the first time in 24 years! McManus Entertainment is excited to announce that legendary rockers Aerosmith will play Sydney’s ANZ Stadium on Sunday 28th April with a stellar line-up of special guests, including Wolfmother, Grinspoon, Spiderbait, The Dead Daisies, Kingswood and Diva Demolition. Aerosmith will also play shows in Brisbane and Melbourne in May. All tickets go on sale from 12 noon on Monday 4th March, 2013. 1993’s Get a Grip was the band’s first album to debut at number one on the Billboard charts and reached number three on the Australian album chart. The album featured two Grammy Award-winning singles, Livin’ On The Edge and Crazy. This was followed up by another number one album in 1997, Nine Lives, featuring the hit single Pink which saw them win their fourth Grammy Award. In 1998 Aerosmith released the huge worldwide smash hit I Don’t Want to Miss a Thing from the film Armageddon starring Steven Tyler’s daughter, Liv. This reached number one all over the world including the US and Australia. The song was nominated for an Academy Award and opened the band up to another new generation of fans. Joining Aerosmith in Sydney is Grammy, ARIA, APRA & Triple J album of the year award winners, Wolfmother. 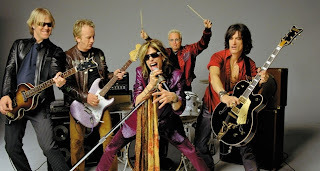 They are coming out of recording hiatus to perform exclusively with Aerosmith. Forming in the early noughties, Wolfmother released their self-titled debut album in October 2005 resulting in close to two million sales worldwide, shows all over the world, multiple ARIA Awards and a Grammy including numerous performance accolades with icons including Jimmy Page & AC/DC to Lenny Kravitz requesting Wolfmother as guests. Following a brief hiatus, the band returned in 2009 with a fresh line-up and the band’s sophomore album “Cosmic Egg” debuting in the upper echelons of charts in over 13 countries including Australia, USA, UK, Canada and Denmark. "Cosmic Egg” also saw the inclusion of many of its songs included within a variety of major films. Wolfmother recently completed a sold out headline and festival tour across Europe and the UK and have since been hard at work writing and recording their third album due for release in 2013. Grinspoon join the line up for the Sydney show. Following a massively successful Big Day Out run, the Aussie rockers are heading off on their own national “Black Rabbits” tour. Grinspoon’s latest singles Passerby and Branded from current album “Black Rabbits” have now joined classics like Chemical Heart, Ready One and Champion, a set described as ‘all killer no filler’. Spiderbait also feature in Sydney. With three talented songwriters, Spiderbait have never been confined by genre or the expectations of others. Combining their punk rock roots with an appreciation of pop song craftsmanship, Spiderbait have put together Greatest Hits, featuring 22 of the greatest tunes such as Buy Me A Pony, Black Betty and new single On My Way. Australian rock band The Dead Daisies will also join Aerosmith on tour in Sydney, Brisbane and Melbourne. The Dead Daisies feature Jon Stevens, Charley Drayton, Richard Fortus, Jim Hilbun and David Lowy. Jon and David first met in 2006 but it wasn’t until 2012 that they started writing songs together. With a mutual love of classic late ‘70s and early ‘80s rock and soul, The Dead Daisies were born. Jon Stevens is one of Australia’s most popular and respected singers. He has had a remarkable career; from lead singer of rock bands Noiseworks and INXS to successful solo artist. Charley Drayton, an American multi-instrumentalist, musician and producer, has played as a drummer and bass guitarist for many bands including Keith Richards project X-pensive Winos, The Cult and Australian bands The Divinyls and Cold Chisel. Guitarist Richard Fortus is currently touring with legendary band Guns N’ Roses, and previously with Thin Lizzy. David Lowy on guitar is best known in Mink, Red Phoenix and The Angels and Jim Hilbun as bassist, saxophone player and melodic vocalist for The Angels and the Divinyls. Kingswood and Diva Demolition complete the super Sydney line-up.